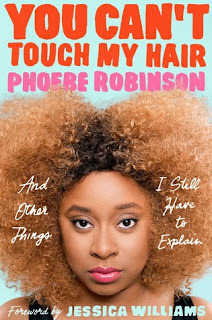 I hadn't heard of Phoebe Robinson before learning about this book, because I'm hopelessly out of touch with pop culture (more on that later.) What got my attention was that it's a book of essays about feminism and race. As you might know, I'm always up for a good feminist rant, but I've also been trying to read more about race issues recently. The first two essays are about black hair, her own and as it is presented in film, TV, and the media. Later essays cover a variety of topics, such as the loaded term "uppity," being the token black friend, the myth of the angry black woman, and racist casting calls. Her essay "Dear Future Female President: My List of Demands" gave me a pang, given the current state of things and what could have been. Her final essay, "Letters to Olivia," is a poignant and hopeful series of letters of advice written to her young niece. As a white lady, I have a lot to learn about what it's like to be black in this country and these essays were pretty enlightening. At the same time, there's a lot I can relate to as a woman. So for me it was a mix of the familiar and the new. And of course much of it was hilarious. She will talk about something pretty serious, but use very comical language and imagery. She manages to strongly call out racism and sexism while still seeming super-friendly, like she's your good friend who cares about you but needs to tell you that you have to do better. I kept waiting for her to call out some horrid, racist behavior from well-meaning white people and recognize it as something I had done (I am a product of my culture, after all) but fortunately for me that didn't happen. (Which doesn't mean I don't need to do better, because surely I do!) But man, some of the stories she relayed! She once took a writing class in which a white woman wrote a story about a slave who fell in love with her owner's daughter and, when an opportunity arises to escape, she chose to remain a slave so she could remain with her lady love. Which, omg, why would you even think this is a heartwarming ending to this story? Anyhow, Robinson is full of stories like this, proving that the world has not changed quite as much as some of us think it has. Phoebe Robinson is at least a decade younger than I am and more hip than I've ever been. Some of her words are hashtagged or made into URLs and it was a bit jarring at first. Like mentioning those who aren't "#Blessed to be Oprah" or remembering when she was younger and thought awards shows were "the bomb.tumblr.com." But soon I got used to her unique style, though it took me most of the book to realize that BTdubs is her way of saying BTW. She also made a LOT of pop culture references. Some I didn't get, and some I was surprised that she got (I wouldn't think 30-year-olds would be familiar with Home Improvement.) Her love and admiration for Lisa Bonet made me want to go back and watch everything with her in it. In summary, this book was both illuminating and a lot of fun to read. I might check out the podcast Phoebe Robinson does with her friend Jessica Williams (who wrote the forward to the book), 2 Dope Queens. I have a feeling it will just make me feel out and very un-hip, but I definitely want to hear more from this talented, witty young woman.